Can you beat TechRadar at our ultimate phone quiz? We all know which one the Vodafone VT1 is, right? Reckon you know a lot about the pocket-dwelling electronic buddies you've had over the years? Think you're the big shot when it comes to telling your friends which phone is best? Well, here's your chance to put your phone knowledge to the test and see how well you can do in our super-tough, proper hard mobile phone quiz. Be warned, it's not all iOS and Android here: the first phone included was released in ye olde worlde of 1985. 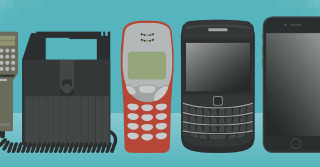 With thirty years of mobiles behind us we had a broad selection of landmark handsets to include plus a few personal favourites from across the years to mix things up a little. Kick off the quiz just below. We can't promise we won't laugh if you score under half, but if you get them all right be sure to tell all your friends and family that you're the Emperor/ress of the phone trivia world. And just for reference: King of Phones editor Gareth Beavis got all 19, deputy ed John McCann managed a sterling 18, while our writers Matt Hanson and James Peckham got 14 and 13 respectively. Feel free to abuse them on Twitter if you do better.